Work those Legs – every day’s Leg Day!!! All too frequently, I see amateurs ruining a good backswing by initiating their downswing movement with their arms. When having completed the backswing correctly, you will have experienced a weight shift to the inside of your right leg (pic 1), obviously, some of your body weight will remain on your left leg due to the fact that the left foot remains in contact with the ground but, upon correct completion of the backswing movement the weight ratio favouring your right leg should be approximately 70/30. The initial downswing movement should be a subtle ‘lateral’ left hip movement before an unwinding/rotating of your hips take you into impact. The upper body (hands, arms and chest) will catch up with the lower body if this movement of the hips takes place correctly. 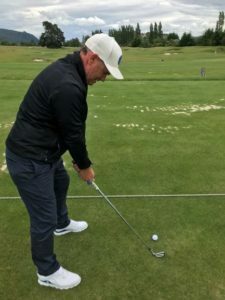 However, if the hands and arms go first it is highly unlikely that the lower body will move fast enough and catch up in time to create our desired impact position. The following practice drill will let you know if your upper body is too dominant – especially in the downswing. It will also help those of you that commonly set-up to the ball with ‘open/ aiming left’ shoulder alignment. Now, simply start your backswing from this position to see how well you strike the ball and also the ‘shape’ of shot you produce. If you start your downswing movement with ‘too much upper body movement’ your legs will not perform the required weight shift to your lead leg (left) to strike the ball sweetly. 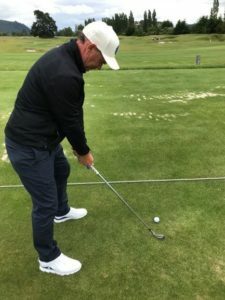 Many of you will have heard the phrase ‘hitting against your left side’ and to do this you have to learn to shift your weight in the direction that you are attempting to propel the golf ball. Next Post:The EV Industry – Are you ready for it? Tom Long is the Director and Head PGA professional at Jack Nickalaus designed Kinloch club in Taupo. He has recently produced a mobile tuition app called “Golf Inside the Scoring Zone” available now at Apple and Google Play stores. 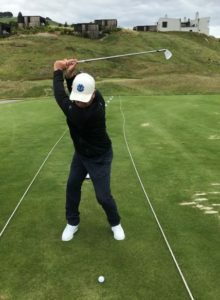 Tom also has had over 500 instructional articles published around the world and has appeared on Sky Sports presenting golf tips.